As on previous occasions dating back to George Harrison and The Concert For Bangladesh, musicians are coming to the aid of those affected by a natural disaster. Several entertainers are gathering at the El Portal Theatre in North Hollywood, CA this evening to help the SAG/AFTRA Hurricane Relief Fund. 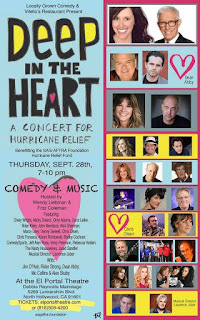 Hosted by Wendy Liebman and Fritz Coleman, Deep In The Heart will offer music and comedy for a good cause. Performers include Micky Dolenz of The Monkees, Vicki Peterson of The Bangles, Jeff Alan Ross from Badfinger, Marcy Levy, The Nasty Housewives, Rockabilly Hall Of Fame inductee Bobby Cochran, Rebecca Holden, Alex Sherman, Chris Olsen, country singer Chely Wright, and Denny Seiwell from Paul McCartney’s former band Wings. Laurence Juber, who was also a member of Wings, will serve as musical director. Comedians Carol Leifer, Orny Adams, Brian Kiley, Chris Fonseca, John Mendoza, Jared Sandler, and Karen Rontkpwski will also be on hand. 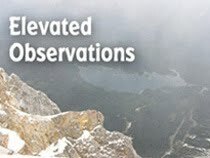 The event starts at 7:00 p.m. Ticket prices for Deep In The Heart range from $25 to $100, with all proceeds going to help the victims of hurricanes Harvey and Irma. I couldn’t find any mention of how people not at the event could donate money, but hopefully that’s an option. Regular listeners of WXRT are accustomed to hearing Terri Hemmert’s Breakfast With The Beatles program each Sunday, but this week, the fab four will also get the Friday Featured Artist treatment. That means songs by The Beatles or from their solo efforts will be mixed in with tomorrow’s regular programming. It’s not as intensive as when Hemmert used to host the marathon Rampant Beatlemania, but it’s still more John, Paul, George, and Ringo to enjoy. In other WXRT news, the station’s Local Anesthetic program will wrap up its decades-long run with the annual holiday broadcast in December. Richard Milne deserves a great deal of praise for serving as the host over the years and showcasing Chicago’s vibrant, multifaceted music scene. He will continue his other on-air work at WXRT. Local alt rock band whitewolfsonicprincess will host a night of rock and roll at The Store venue at 2002 N. Halsted in Chicago this Saturday, September 30. Parallelicopter and The Remember Knots will also be performing that night. Earlier that day, whitewolfsonicprincess will do a 3:00 p.m. show as part of Project Adoptable’s The Doggone Music Festival at IO Theater on Kingsbury in Chicago. Admission is $20, which includes a drink. Project Adoptable is celebrating its first year of saving dogs through adoption. Congratulations to Sunshine Boys, the recently formed trio of Freda Love Smith, Jacqueline Schimmel, and Dag Juhlin, on selling out its show with Utah Carol at Daly Barn this Saturday, September 30 in the Lincoln Square neighborhood.